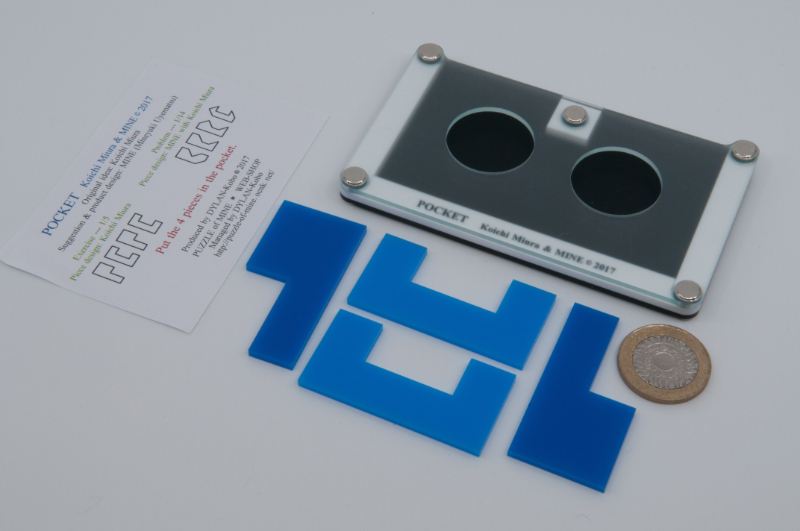 A couple of weeks ago I managed to acquire a couple of rather interesting little restricted tray packing puzzles from Wil… and I managed to find some puzzling time earlier this week so I hauled them out and worked my way through them in between one of my other little projects. Pocket had been entered in the 2018 Nob Yoshigahara Puzzle Design Competition but I hadn’t been able to have a bash at it in San Diego – so when I saw a copy in one of Wil’s crates I pounced on it. Designed by Koichi Miura and MINE, my copy came with two sets of pieces, each of which needs to be inserted into the tray through the slot at the top… which holds the only little wrinkle: a single obstructing voxel. The two sets of pieces appear to be a beginner’s puzzle and a slightly more advanced puzzle – with the beginner’s pieces all being made up of two pairs of blocky pieces (C’s and P’s – both hexominoes) and a little playing will convince you that there’s probably only really one way to arrange all of those pieces in the tray, so the puzzle reduces to finding a way to get them in there… as I said, I think this is the beginner’s challenge – in fact, it wasn’t even used in the Design Competition. The second set of pieces provides a slightly trickier challenge: all four pieces are different and they all have 45 degree corners / cut-outs… which makes for a lot of interesting ways to combine them in the shape and size of the tray provided… sadly, however, most of those arrangements are precluded by that one, pesky little voxel sitting in the centre of the top slot… I should know, as I spent an awfully long time trying various arrangements that turned out to be un-assembleable. (It IS a word, now!). Finding the one that does work is quite a treat – it definitely rewards the solver in a delightful manner. I hadn’t ever seen or heard about Packing Puzzle 4P until I stumbled across it at Peter’s place – I did recognise the designer’s name - Hajime Katsumoto – and I have rather enjoyed a few of his other designs, so I took a punt and I ended up being rather glad I did. There’s a two-sided tray, helpfully titled “Puzzle 1” and “Puzzle 2” and a set of four P-pentominoes… it’s pretty clear from the get-go that you need to put the four pieces into each of the (slightly obstructed) 4 * 5 frames. The holes on the first side are big enough to allow pieces to be inserted either way up, which is helpful… and you can fiddle around for a while and realise that you’re going to need to be a little creative in order to find a solution to this one… it’s quite a cute little solution and gives a nice little “A-Ha!” moment. Desperation led me to resort to Think(C)ing (it’s been a while!) and then even to consider CHEATing – although I did manage to stop myself just short of doing that when I realised I wouldn’t actually be able to UNDO the thing I was about to DO… until the right little briefest flash of inspiration struck and seconds later side 2 was solved – love it! The last puzzle in this post turned out to be my first and second prize for A2P2 – each year my competition winners are invariably puzzle collectors who already “have everything” – so finding a puzzle they haven’t got turns into an annual conundrum for me… with Wil Strijbos invariably managing to turn up something SO NEW that nobody could possibly have a copy yet – Framed Jigsaw was that puzzle this year. 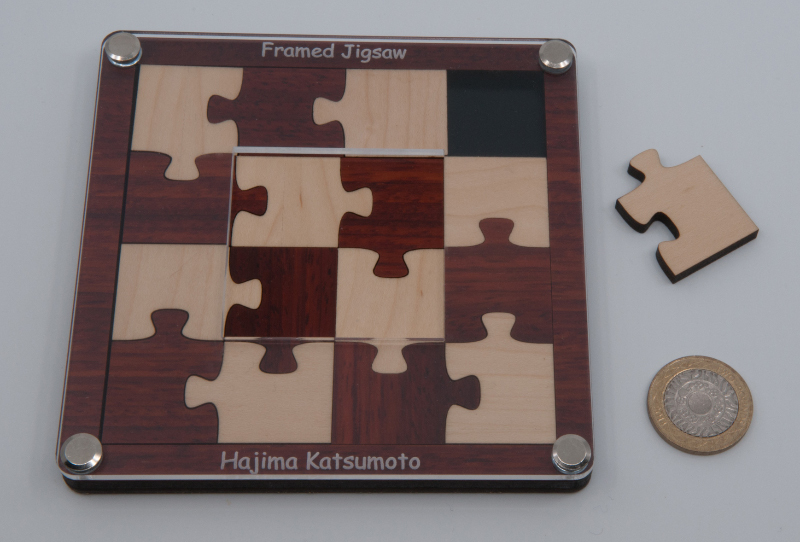 The original design comes courtesy of Hajime Katsumoto (yes there’s a spelling mistake on the puzzle... sorry) but it’s been “Streetwise’d” and “JCC’d” resulting in the improved version here – the pic shows the starting position with what appears to be a nicely checkered set of jigsaw pieces under a partial clear frame – with a central 2*2 hole… almost fully constructed – except for the final piece that obviously(!?) belongs in the top right hand corner – is the wrong colour for a neat checkerboard pattern, and has a tongue and a groove too many… which is odd. Get all the pieces out and some things become apparent, like all tongues fit all grooves – and there are the same (ergo just enough) number of each…which is great: it means there are LOTS of ways of constructing a 4*4 square with those pieces. How many of those do you think are assembleable (yup, still a word! Work with me here…)? Hey, they look very nice! ...you could try William Strijbos, or one of the Japanese puzzle shops (Puzzle of MINE or Torito) - but you will probably need to use a Japanese re-shipper in the case of the Japanese shops.